Venus, my original top bar hive, has 14 inch bars. It works great, though the comb area is comparable to a single medium frame and there is no ability to interchange bars with my Langstroth hives. It overwintered last year and seems good this winter as well, so no complaints. Last year I put Saturn into action, a hive I built with my dear old dad (see Beehive House). Saturn has 19 inch bars to match the frame length in Langs, so the top bars fit in a Lang box even though the comb is not exactly the same. We actually built two hives, and I hope to put the other one into service this year. 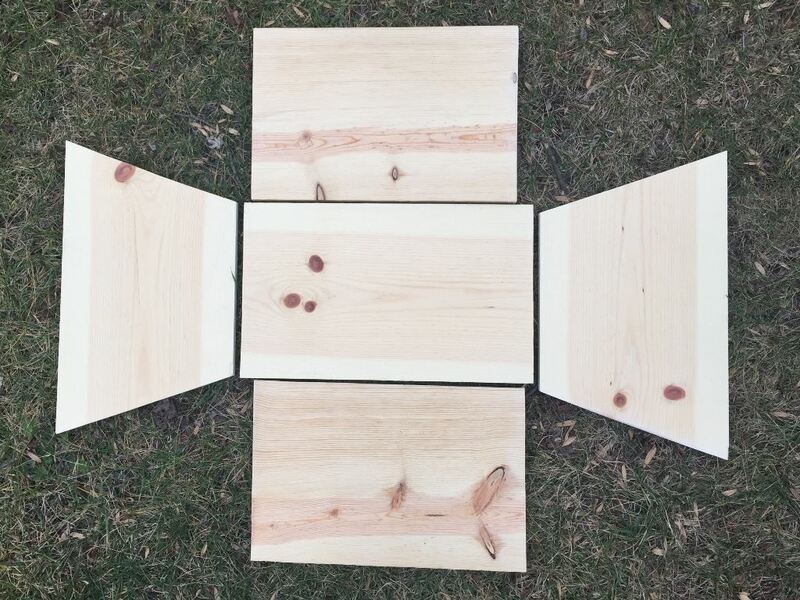 The design was based on Wyatt Mangum’s plans from his book, using 1×12 boards with a 12-inch diagonal. So last weekend I tried my hand at a top bar nuc using a similar design. The base of Saturn is not as wide as I originally expected. 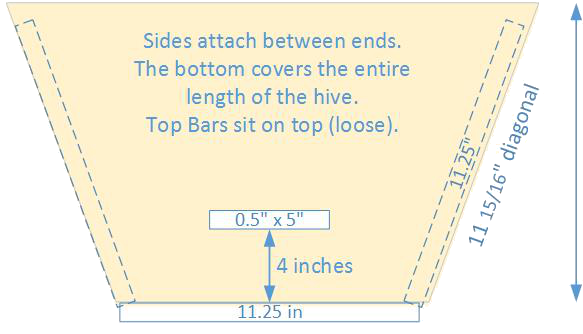 A 1 x 12 board is 11.25 inches wide, yet the hives we built have a base around 10.5 inches wide. I realized that if I shortened the sides by 1/16 of an inch, I would end up with a base closer to 11 inches. So that is what I used for the nuc. I purchased my wood at Lowe’s, brought it home and started measuring. Much to my dismay, the numbers didn’t add up. It took me 20 confusing minutes to realize that the board was only 11.125 inches wide, short by 1/8 inch. What! So I returned the boards to Lowe’s and went to Home Depot (which is further away, but I can be petty). There was some variation in their wood as well, but I managed to find 11.25 inch boards. It turns out I can’t completely cut straight with a circular saw. It worked out in the end and I am quite happy with the finished hive. Per Mangum’s suggestion, I screwed the sides together with no glue, which allows boards to be replaced in the future. Unfortunately now I have to paint this, though not this week. The hive holds 12 bars. Last year Venus overwintered with 12 bars, so I could probably carry this hive through the winter. If I do this again I may try a hive 11 inches deep, which still holds 8 bars and would be easier to manage as a nuc. I will also look for a better source of wood around here. This rather apt quote, found on brainyquote.com, comes from a speech by Margaret Thatcher at a Soviet Official Banquet in the Kremlin on March 30, 1987. I like my modified quote for this post because a world without bees may indeed be a less stable one, and perhaps even dangerous as our fruit and many other foods are pollinated by honey bees. The increase in diseases, pesticides, and other stressors has made keeping hives alive from year to year much more difficult than it used to be. The use of nucleus hives, or nucs, is one method found to help maintain honey bee populations. A nuc is typically only 5 frames, so fewer resources are used per hive and many beekeepers have learned to overwinter these small colonies. 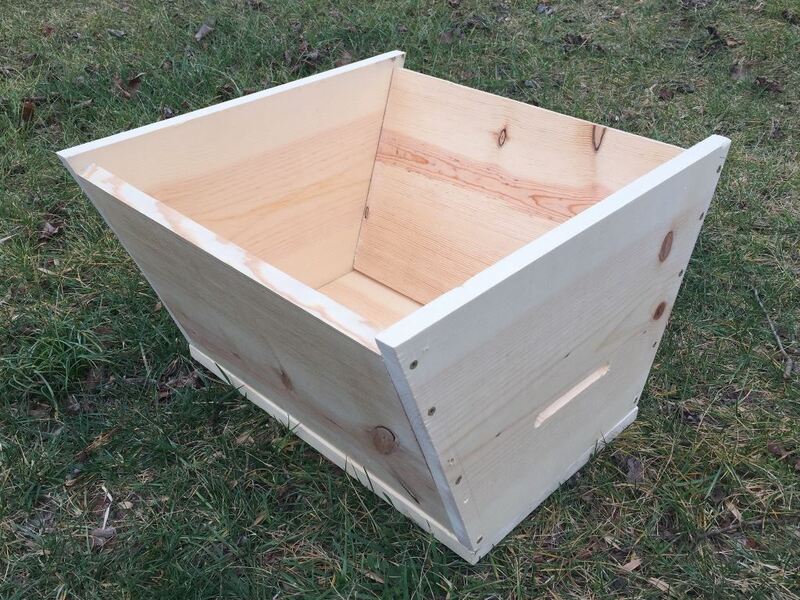 The following spring a nuc grows quickly into a full-sized hive that can be used for pollination, honey production, or other uses. Nice job — it looks great! We feel your pain, having also been betrayed by supposedly standard sizes of dimensional lumber. Yet it looks good in the picture. Did you freehand the circular saw cuts? Or clamp a straight board for a fence? Thanks, I was quite dismayed. What is the sense in having a standard size if the boards are not a standard size. My dad buys better quality wood from a lumber yard, so guess I will be looking into that as well. I did freehand the circular cuts. There was a line, at least! I probably should have clamped it down to keep it in place, as that might have helped me cut straight. That also requires more equipment and setup…. Maybe next time.